BayadLoad, a world-first and the newest innovation in the e-money space, will initially address the urgent need of an estimated 1.8 million employers and 2.5 million domestic service workers to comply with Republic Act No. 10361 otherwise known as the Kasambahay Law, which took effect last June 4. It can also be used by over 10 million self-employed individuals who are making voluntary contributions to the Social Security System, Philippine Health Insurance Corp. and Home Development Mutual Fund also known as Pag-IBIG Fund. The Kasambahay Law is a landmark piece of labor and social legislation that gives domestic service workers the same security benefits given to those in the formal sector. It was enacted to protect and promote the welfare of household workers. It requires, among others, that a kasambahay who has rendered at least one month of service have SSS, Pag-IBIG and PhilHealth coverage. BayadLoad is an e-money platform that allows mobile phone subscribers of Smart, Talk N Text and Sun Cellular —be it the kasambahay or the employer—to pay conveniently and securely premiums to SSS and PhilHealth, and contributions to Pag-IBIG Fund via the mobile phone, saving them a lot of time and expense plus the inconvenience of queuing at the branches of these agencies, in banks or other payment centers. This service was approved by the Monetary Board, the highest policy-making body of the Bangko Sentral ng Pilipinas, on June 6 by virtue of the electronic money issuer (EMI) license granted to Smart subsidiary, Smart Hub, Inc.
“Necessity is the mother of invention. BayadLoad is the answer to a smoother implementation of the Kasambahay Law. It’s as easy as buying load and it can work even with the most affordable basic phones in the market,” said PLDT Group chairman Manuel V. Pangilinan. "We are making available our extensive distribution network of over one million retailers nationwide where the public can top-up their BayadLoad wallets, making it a pervasive and convenient payment channel,” said Charles Lim, EVP and Head, Wireless Consumer Business for Smart and Sun Cellular. Developed by Smart subsidiaries, Smart Hub and Voyager Innovations, BayadLoad is a separate wallet or bucket linked to a mobile phone but unlike airtime load, it has no expiry and cannot be withdrawn in cash. It can only be redeemed for payment to an identified payee, in this case, SSS, Pag-IBIG and PhilHealth. Initial users have to register via their mobile phones their SSS, PhilHealth and Pag-IBIG accounts to avail of the service. An SMS notification will be sent to both the employer and the kasambahay once payment has been transmitted to Land Bank of the Philippines, the government’s official depository bank, which will handle all settlement and reconciliation processes and credit all payments made to each covered government agency. The service will initially be available to Smart, Talk N Text and Sun Cellular subscribers by July 1. "LANDBANK is proud to be Smart's strategic partner in making financial inclusion truly a reality by enabling its massive distribution network of over one million retailers nationwide as conduits in reloading the BayadLoad wallets of their more than 70 million subscribers. It is just like bringing government service at the sari-sari store level and more at the fingertips of the mobile users—truly transformative and viral," said Gilda Pico, LANDBANK president and CEO. “Bayadload hits the sweetest spot where technology meets the basic needs of the people,” Smart Chief Wireless Advisor Orlando B. Vea said. This was the case 11 years ago when Smart launched the world’s first electronic, over-the-air mobile phone air-time loading service that revolutionized the cellular phone business. Through Smart Load, the telco was able to expand its subscriber base far beyond industry expectations and at the same time, created an army of micro entrepreneurs who earned additional income by selling a very lucrative virtual product, the cellphone load. For this reason, Smart is the only Philippine telco so far that has been recognized by the United Nations Development Program with a World Business Development Award for validating that making a profit and doing the right thing can come together. This award was given to Smart in 2008 in New York City. "BayadLoad is transformative. It helps make compliance to the Kasambahay Law more convenient for the employer and the kasambahay. This will, in turn, help make our kasambahay, who takes care of our needs at home, have access to provident, housing and health insurance benefits that were previously not made available to them,” said Vea. Payments for SSS, PhilHealth and PagIBIG are just the initial applications for this powerful mobile commerce platform. “There’s more to follow,” added Vea. This service innovation is being supported by international organizations advocating for financial inclusion and financial literacy such as the Scaling Innovations in Mobile Money Project of the United States Agency for International Development (USAID), Mercy Corps, and the Better than Cash Alliance where Philippines is one of four founding member-countries together with Kenya, Colombia and Peru along with the Gates Foundation and the United Nations Capital Development Fund. "Mercy Corps applauds the work of the Philippine government and Smart in this breakthrough to make key government payments available for low-income Filipinos via mobile phone. In the arena of financial inclusion and social protection, the possibility of leveraging mobile technology to link the poor to the digital highway is critical. This is an innovative step in inclusion, which we believe is the first of its kind in the world and may well benefit millions and also help build the key trust needed for the poor to make the full leap into the formal financial system,” said Leesa Shrader, Senior Director for Financial Innovation, Mercy Corps. 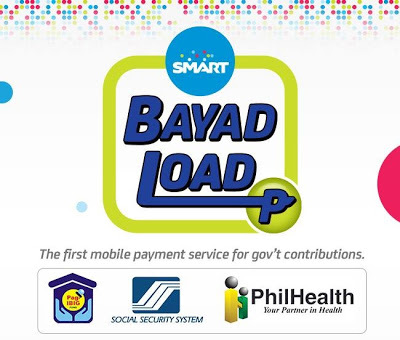 BayadLoad will also help support the government’s efforts to improve collection efficiency with its broader coverage, accessibility, convenience, ease of use, transparency and security. Plans are that this service will eventually serve as a micropayment channel for other government fees and services such as securing the driver’s license with the Land Transportation Office, getting a clearance with the National Bureau of Investigation, requesting a copy of one’s birth certificate with the National Statistics Office or even paying for a new passport with the Department of Foreign Affairs.